Regulation of legal services differs in important ways across the common law world. In Canada, self-regulation is generally the approach. Canadian law societies are authorized by provincial legislatures to decide who can practice law and provide legal services. The substantial majority of the governors of the law societies are lawyers elected by lawyers. In Ontario, paralegal benchers are elected by regulated paralegals. In England and Wales, the Solicitors Regulation Authority and the Bar Standards Board are the regulators. The majority of the governors of these regulators are not solicitors or barristers. In the United States, the state courts are the regulators. While lawyers have an active role, the courts are the ultimate decision-makers. The American Bar Association plays an interesting role in the U.S. context. The ABA is not a regulator, rather is “the national representative of the legal profession”. As a voluntary bar association, the ABA is governed by its House of Delegates. The ABA promulgates its Model Code of Professional Responsibility which is the starting point for the rules adopted in most states. The ABA plays an important harmonizing role with respect to legal education and legal ethics. The next time the ABA addressed this question was during the Ethics 20/20 Commission commenced in late 2011. A discussion draft from the Commission invited comment on limited non-lawyer ownership in law firms. The response from lawyers was little different than in 1983. The Illinois State Bar Association and the Senior Lawyers Division filed a resolution apparently designed to prohibit even discussion of the topic. The 20/20 Commission abandoned further discussion of the topic. In 2015, William Hubbard, the then President of the ABA, established the ABA Commission on the Future of Legal Services, which was established to “make recommendations on how technology and innovation can help expand the availability of affordable legal services to the poor and middle class”. This approach was notably different that the Kutak Commission and Ethics 20/20 being expressly focused on unserved and underserved legal needs. After an impressively thorough and thoughtful process, the Final Report of the Commission on the Future of Legal Services is expected to be released in August 2016. The Commission has proposed one resolution to the House of Delegates which was adopted (with a significant amendment). each state’s highest court, and those of each territory and tribe, be guided by the ABA Model Regulatory Objectives for the Provision of Legal Services when they assess the court’s existing regulatory framework and any other regulations they may choose to develop concerning non-traditional legal service providers. This resolution was consistent with approach taken in the establishment of the Commission, which was to focus on legal needs and not just providers of legal services. Significantly, the resolution proposed a principled approach by the regulators (the state courts) in assessing existing and proposed regulatory frameworks concerning non-traditional legal service providers. … nothing contained in this Resolution abrogates in any manner existing ABA policy prohibiting non lawyer ownership of law firms or the core values adopted by the House of Delegates. On behalf of the Section of Family Law, we pose the following question: WHAT PART OF “NO!” DO YOU NOT UNDERSTAND? We remain unalterably opposed to these repeated, previously failed efforts to foist ABS upon our profession or our ethics. When the time for presenting further resolutions by the Commission passed in the spring of 2016, the Commission did not make any proposals. This is not particularly surprising given the nature of the ABA. Some will no doubt see the responses by the House of Delegates as principled. Others will see self-interested protectionism by a voluntary bar. What seems to me most interesting is that this is an issue that clearly isn’t going away yet the ABA seems unable to come to terms with it. This seems inevitably tied to the reality that market incumbents tend to perceive issues in accordance with their own interests and to protect their own interests. One conclusion that might be drawn is that non-lawyer investment in law firms is a dead letter in the U.S. because the lawyers in the House of Delegates will never allow it. But I think the better conclusion is that the ABA has ceased to be the practical decision-maker because of its conflicted and ineffective governance in this context. So, what is the evidence for the later conclusion? When a controlling number of the decision makers on a state licensing board are active participants in the occupation the board regulates, the board can invoke state-action immunity only if it is subject to active supervision by the state. Where the state courts are the decision-makers or actively supervise state bars, this decision appears irrelevant. However, the decision clearly raises the risk of anti-trust prosecution for voluntary bar organizations and reinforces that the state courts are the decision makers with respect to practice of law. Recourse to the courts becomes a choice where self-regulation limits competition. The second is activity within the state courts (as regulators rather than as adjudicators) to address impediments to access to justice. While focused on access in the litigation context rather than legal services more generally, the state courts are fairly seen as innovators compared to the ABA House of Delegates. To ensure access to justice in civil and criminal matters for New Yorkers of all incomes, backgrounds and special needs, by using every resource, including self-help services, pro bono programs, and technological tools, and by securing stable and adequate non-profit and government funding for civil and criminal legal services programs. The limited reference to “civil and criminal matters” is notable but so too is the reference to using “every resource” including “technological tools”. The Illinois Supreme Court Access to Justice Commission similarly is charged with “promoting, facilitating and enhancing equal access to justice with an emphasis on access to the Illinois civil courts and administrative agencies for all people, particularly the poor and vulnerable”. The third is activity from legislature and from competition authorities. The end of self-regulation in England and Wales came in large part from concern that self-regulation was inherently protectionist and was limiting access to legal services by limiting innovation in the provision of legal services. The result was the Solicitors Regulation Authority and the Bar Standards Board. There is recent evidence of such activity in the United States. A bill has just been adopted in North Carolina which would “exclude from the statutory definition of the practice of law the operation of a website that offers consumers access to interactive software that generates legal documents in response to consumer input”. This bill follows litigation between the North Carolina State Bar and Legal Zoom that was recently settled. At issue was the application of the North Carolina Board of Dental Examiners case to attempts by the North Carolina State Bar to ban Legal Zoom as unauthorized practice. The Division and FTC staff believe that “the practice of law” should mean activities for which specialized legal knowledge and training is demonstrably The Division and FTC staff believe that “the practice of law” should mean activities for which specialized legal knowledge and training is demonstrably necessary to protect consumers and an attorney-client relationship is present. Overbroad scope-of-practice and unauthorized-practice-of-law policies can restrict competition between licensed attorneys and non-attorney providers of legal services, increasing the prices consumers must pay for legal services, and reducing consumers’ choices. The underlying theory of this bill appears to be to draw a line between traditional legal practice (the practice of law) and new forms of legal service delivery. The intent would appear to be to separate regulation of “the practice of law” from regulation of new ways of providing legal services and thereby to limit the ability of lawyers to inhibit competition. The strong position of the House of Delegates has been to seek to ensure that the practice of law is not contaminated by other interests. The conundrum is that the practice of law, as currently permitted, does not fully satisfy the legal needs of middle and low income people. There are two paths through this conundrum. One is to encourage innovation in the practice of law by allowing access to capital and expertise, particularly technological. The other is to allow innovation by “non-lawyers” while keeping the practice of law unchanged. With the ABA House of Delegates having firmly drawn a line in the sand, it may be that the state bars will become the regulatory innovators permitting change in the way that law is practiced. It may also be that the ambit of “practice of law” will become important with innovation being permitted outside of the “practice of law” as narrowly defined. The later course suggests that the role of the legislatures and competition authorities could increase in importance and that the courts (and the House of Delegates) will be limited to the traditional practice of law. What are the implications for Canada, if any? We know that lawyers primarily serve people in criminal law, family law, personal injury, real estate and wills & estates work. Outside of these areas (the so-called 85%), ordinary people don’t use lawyers to address legal problems. Within the traditional areas, approximately two-thirds of family law litigants do not use lawyers. Self-regulation in Canada is challenged by unserved and underserved legal needs and by new ways of providing legal services. There is no doubt but that protectionist pressures on law societies exist both in election campaigning and by fact that the majority of law society governors are market incumbents. While professional interests and the public interest are aligned in much of what professional self-regulators do, this is not so where policy choices involve competition for the profession. Presumably, the challenge is less where needs are unserved or underserved. In areas of existing professional practice, the challenge is much greater. North Carolina may be taking a different approach than the usual approach to ABS which is to facilitate new ways of providing legal services without affecting existing legal practices. This is resonant with English legal services regulation where it is necessary to be “authorized” to provide legal services only in certain “reserved areas”. The legal services regulators do not have authority over unreserved areas except where services are provided by regulated persons. In effect, the North Carolina bill would create an unreserved area by limiting the definition of “practice of law”. One of the available policy choices for us is to allow new service provision in unserved and underserved needs while leaving existing practices to serve the legal needs that they now serve. Embedded in this policy choice is the question of whether new service providers should be regulated and, if so, by whom. The English experience suggests that ordinary consumer protection law may be sufficient to address unreserved areas. The U.S. experience suggests that self-regulators may be too conflicted to be regulate new market entrants in the public interest. The same question and challenge was raised in Ontario when paralegal regulation was being considered. Having the Law Society become the self-regulator of lawyers and paralegals was naturally of concern to many paralegals and to policy observers. Would lawyer self-interest compromise paralegal regulation? The answer is mostly that things have worked out pretty well despite early tensions. However, it is also right to observe that human nature is unchanged and both lawyer and paralegal benchers are affected by their professional self-interests. But this tends to get worked through because benchers work together and, on most issues, can collectively get past their self-interest. But this is not so on all issues. A point of this reflection on paralegal regulation is that a self-regulator that regulates new professions or new ways of providing services thereby must change its nature. The Law Society of Upper Canada became different when it became the regulator of Ontario paralegals. If law societies seek to regulate new forms of providing legal services, it inevitably follows that the nature of law societies will change. This is not necessarily a bad thing given the additional perspectives would result. But for those who see independence of the legal profession (as well as independence of individual lawyers) as of fundamental importance, this prospect will be of concern. Where does this leave us? It seems to me inevitable and proper that new ways of providing legal services will be allowed in unserved and underserved areas. Whether Canadian law societies are up to the challenge of allowing this is unclear. But if they don’t, someone else will. If encouraging the evolution of the existing practice of law with new forms of capital and expertise is not in the cards, permitting new entrants is the alternative. The question then will be how new entrants should be regulated and by whom. For traditionalists, it seems to follow that the preferred approach would be the English approach; to allow new entrants in areas not currently well served and not to seek to have the law societies regulate them. In this way, existing legal practises and self-regulation are protected while innovation is encouraged where it is most needed. While ironic, the answer for those who wish to avoid competition from new entrants may be limited de-regulation. For those who prefer to see traditional legal practices evolve to address unmet legal needs, there is also some value in this approach. New entrants in underserved areas will challenge those now providing services. This competition will cause evolutionary change for the incumbents. However, limiting access to capital and expertise to incumbents will limit the ability of the incumbents to evolve to face new challenges. Do we allow new entrants where there are unmet legal needs? It seems to me that if law societies don’t then someone else will. Should law societies seek to regulate new entrants? If they do, they will change as a result, which isn’t necessarily a bad thing – but it is a thing. Should existing legal practices be allowed new resources to evolve? If so, there will be change. Probably not as much change as is feared by many – but again a thing. On the other hand, refusing to permit evolution has its own risks. Making choices is hard. But, as Chief Justice McLachlin has said, “The question is not whether the rules governing the legal profession should be liberalized, but how”. This is mostly but not completely true. In some states, the state legislature has jurisdiction. As well, other authorities before which lawyers practice assume regulatory authority over those lawyers. The SEC is an example. This may be seen as analogous to the courts regulating rights of audience. In Canada, the situation is quite different with the Federation of Law Societies playing this harmonizing role. Yet again the question is where were the lawyers? I expect that Canadian lawyers would generally accept that proper professional conduct includes upholding solicitor-client and litigation privilege. After forty years, it is appropriate to question whether the Codes and Rules of Professional Conduct ought to say just that and to ensure that the confidentiality rule and privilege work sensibly together [i]. But after forty years, the context of the conduct rules has gradually changed over time such that what was appropriate forty years ago may not be appropriate now. It would be hyperbolic to say that the water is now boiling [vi], but we are in quite a different world so far as protection of information in the legal system is concerned. It is worth reconsidering a rule which pre-dates the careers of most of the lawyers now in practice. I’ve been amazed in this debate how much each side kind of talks past each other, dismisses the concerns of the other side, or the point of the other side. In its interim report, the Working Group reported that it would not further consider non-licensee ownership or control of traditional practices at this time. Rather, four other areas would be examined. It was disappointing to have a leading ABS proponent respond to the interim report saying that the “foul stench of protectionism” explained the report and to have another say, less dramatically, that “the outcome in Ontario points to the triumph of politics over principle”. While it would be naïve to think that strong views will change as a result, I think it important to say for the record that the ABS Working Group, a diverse group[i], worked hard to genuinely address a complex question. The report was a consensus report supported by all members of the working group. Being thought wrong is fair enough especially on complex issues. But I don’t accept the allegation that our interim report is unprincipled. It is not. On the other hand, it has to be admitted that professional self-interest is not an unreasonable concern. Professional self-regulation on issues where the public interest and professional self-interest can diverge is a challenge to be addressed with care. The public interest must govern. But to the Interim Report. Why not move forward now to majority or control of traditional practices? My own view is principally premised on observations of the effect of ABS in Australia and in England. The first observation is that minority non-lawyer ownership has been broadly adopted in Australia and is the greatest part of ABS licensing in both Australia and England. There appear to be real advantages seen in minority investment for these practices and little or no expressed concern. The second observation is that the largest effect of majority non-lawyer ownership in both Australia and England has been consolidation in the personal injury sector rather than creation of new enterprises delivering new legal services or delivering legal services differently. Recognizing that personal injury work in Ontario is principally available on the basis of contingent fees, it is unclear to me that injured persons would be better or more economically served by large consolidated firms. And it is difficult to imagine reversing a decision which consolidates an area of practice. Watching and waiting for evidence to develop seems the better course to me. It is also material to me that the current personal injury model in Ontario, based in contingent and referral fees, is raising concerns for many. It seems sensible to work through these concerns before considering significant changes. In England, there have been more innovative practices using majority ownership than in Australia. This is not surprising given the much larger English market and given the importance of London as a capital centre. But significantly, when thoughtful English analysts were asked for their views of the impact of ABS since 2012 when first permitted, the consistent answer was that it is too early to assess the impact of ABS. Waiting a bit seems sensible to me. Another perspective comes from innovation research and theory. Ray Worthy Campbell’s work has been important in my thinking. Professor Campbell observes that it is very difficult for existing businesses to do things in a fundamentally different way. Building on the work of Harvard business professor Clayton C. Christensen, this is the idea that sustaining innovation is much more likely than disruptive innovation for most businesses. My belief is that many legal needs are unmet is because the only permitted form of business, professional consultancy in which expensive expert time is applied assessing and solving problems, is inherently too expensive to address many currently unmet legal needs. Putting these thoughts together, it seems very unlikely that traditional professional legal consultancies will evolve into something quite different if majority non-lawyer ownership is permitted. It seems logical to think that permitting majority ownership would lead much more to consolidation of existing practices than to transformation of existing practices into something different. It seems likely to me that new technologies and other genuine innovations are more likely to come from new providers than from existing providers. But encouraging evolution of existing traditional practices to deliver more than they now do seems worth-while. A third perspective is practical. We do not have the regulatory infrastructure in Ontario to deal appropriately with significant new forms of non-lawyer owned legal service providers. On the other hand, regulating traditional practices with some non-lawyer ownership is more easily accomplished. An incremental regulatory path is attractive from a pragmatic perspective. These are some of the principal reasons that caused me to conclude that serious examination of majority ownership or control of traditional practices should wait with examination of minority ownership being a better focus for the time being. I should add franchise arrangements to minority ownership as possibly a way of allowing evolution of existing traditional or consultancies “professional consultancies” to achieve advantages of scale such as branding, business and legal expertise and infrastructure. Another area that appears to merit examination has been labelled ABS+ acknowledging the contribution of Professor David Wiseman to the ABS discussion. The Working Group will examine allowing and encouraging “civil society” organizations to deliver legal services. One version of this is analogous to multidisciplinary practices (MDP) in which non-legal services can be offered by legal practices. The MDP idea is that “one-stop shopping” can be attractive to clients. Flipping this idea recognizes that there are important organizations already serving other needs, whether for particular vulnerable populations, low income people or the middle class, through which legal needs might also be served. People who won’t go to a lawyer or paralegal’s office could access legal services where provided ancillary to other important services. Another version would harness existing organizations who are trusted in their communities permitting them to provide legal services as well as being intermediaries between their communities and legal clinics. The fourth area for examination is the least well defined. We know that there are substantial areas of unserved legal need. Yet only lawyers and paralegals are permitted to deliver legal services in Ontario. There is no lack of lawyers and paralegals yet legal needs go unserved. Part of the answer may be innovation by traditional practices. Part of the answer may be better access to legal information so that people can better serve themselves. Part of the answer may be civil society organizations delivering legal services differently. Part of the answer may be that it is counterproductive only to permit licensees to deliver legal services – especially where they don’t. But part of the answer may also be that innovative practices, applying significant capital to technological and business innovation, may be needed. The traditional labour-intensive professional consultancy model has its limits and other business models, with different financing, may be of value to meet unmet needs. As said at the outset, I don’t expect that those with harsh views on either side of the ABS divide will change their thinking because of this column. But I hope some will find elaboration of a less certain perspective to be of value. When the Chief Justice of Canada highlights global liberalization of legal services regulation, recognizes that our old monopolies are fading, says that the legal profession must embrace new ways of doing business and that the question is not whether our rules should be liberalized but how, even those most resistant to change must take heed. First, where does the profession stand as it enters the second quarter of the 21st century? Second, what are the forces that have led to the challenges the profession is facing? Third, against this background, how can the profession move towards the newer world it seeks? Statistics support the view that accessing the justice system with the help of a legal professional is increasingly unaffordable to most people. Nearly 12 million Canadians will experience at least one legal problem in a given three-year period, yet few will have the resources to solve them. According to an American study from a few years ago, as much as 70%-90% of legal needs in society go unmet . We all know that unresolved legal problems adversely affect people’s lives and, ultimately, the public purse. Among the hardest hit are the middle class – who earn too much to qualify for legal aid, but frequently not enough to retain a lawyer for a matter of any complexity or length. Additionally, members of poor and vulnerable groups are particularly prone to legal problems, and legal problems tend to lead to problems of other types, such as health issues . These are important points. Legal problems are common yet most legal needs go unmet. The middle class, the poor and vulnerable groups all suffer unmet legal needs. … the digital revolution and the modern social and economic forces it has unleashed are creating new modes of delivery of traditional legal services, creating new demands and expectations for meaningful access to justice, and eroding the fundamental assumptions upon which the legal profession of the past was built. This is compelling the legal profession to revise old patterns and approaches – to seek, in Tennyson’s phrase, “a newer world”. Liberalization of the rules that govern the legal profession is rapidly spreading to other jurisdictions, like the U.K. and Canada. Recognizing this, the Canadian Bar Association recently launched a “Legal Futures” probe into the future of the legal profession, to help the Canadian legal profession remain relevant, viable and confident in the face of change. Everywhere, more and more, the profession is accepting that the old monopolies are fading and that the profession must embrace new ways of doing business. And increasingly calls are heard for law schools to adapt their curricula to these new realities. The question is not whether the rules governing the legal profession should be liberalized, but how. The first step is to accept the idea of change. Lawyers and judges need to stop fearing change. Rather, they must accept that change may be necessary. Change should not be seen as an evil, but rather as the source of new opportunities. [Lawyers] will need to develop strategies to cope with the fact that in the very near future, straightforward, out-of-court work will face brutal competition. They will need to use technology in creative ways. And it may be that they will need to accept that some tasks traditionally performed by lawyers can be out-sourced to non-lawyers. A … source of opportunity for the profession lies in expanding service to sectors that may not have benefited from legal services in the past. Many communities have traditionally been underserved in terms of legal services. Some suggest that the way of the future lies in cutting back legal services. A better way may be to find ways of delivering legal services to people who need them but have traditionally not received them. Lawyers should not forget that those whose legal needs are not being met come in many forms. … These very different clients all have two things in common: They cannot afford legal services when delivered in the traditional way, and they cannot afford the disproportionate cost of pursuing a case in court. The consequences for legal businesses are plain: for businesses to thrive, they will need to find innovative ways to make their legal services more generally affordable. [Another] source of opportunity lies in collaboration with other lawyers and other professionals, in recognition of the fact that clients’ problems are often complex, polyvalent and incapable of solution on uniform cookie-cutter models. 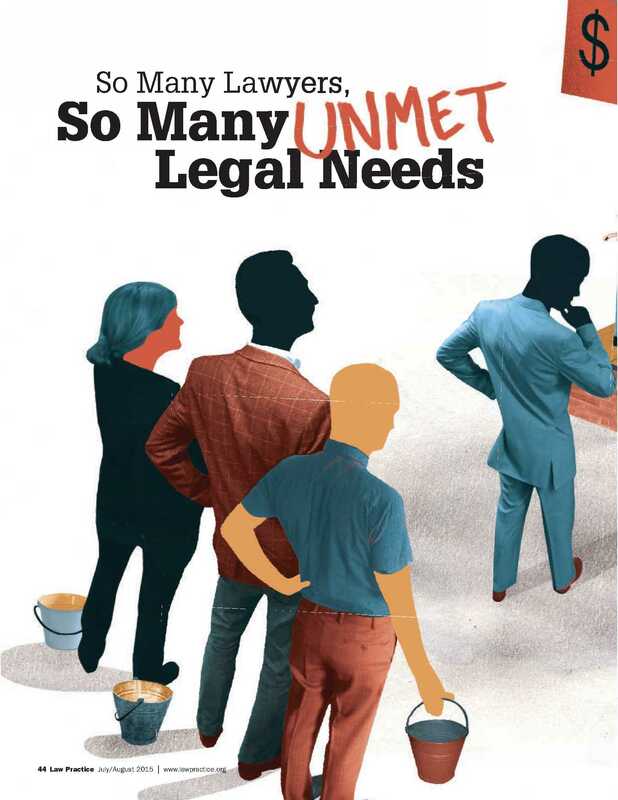 In my recent article So many lawyers, so many unmet legal needs, I addressed the apparent paradox that so many lawyers are looking for work and so many legal needs are unmet and suggested that regulation was part of the reason that the legal services marketplace does not evolve to permit supply to address demand. The Chief Justice’s call for regulatory liberalization and finding new ways of delivering legal services to people who need them but have traditionally not received them is to the same effect. As the title to this column signals, innovation is needed and is inevitable. For lawyers, the question is whether we will innovate or “be innovated”. The point of this column is to talk about different types of innovation. As a recent discussion with a bencher colleague made clear, what we mean by innovation in this context isn’t always obvious. Of course, some innovation is big and transformative. One example is artificial intelligence. The Globe and Mail recently reported on Ross, the app which uses IBM’s artificially intelligent Watson computer to do legal research. Scary stuff perhaps but the potential to directly deliver some lower cost legal services is obvious. Another innovation is the use of large business processes to deliver legal services. Some sneer at “commoditization” and reject the idea that lower cost services may be desirable, even necessary, in some contexts. But some innovation is simpler and not necessarily transformative, at least from the perspective of practising lawyers. For example, we know that there are substantial civil needs in society that are not addressed by lawyers yet the lawyer’s monopoly extends to areas unserved by lawyers. Allowing others to serve these legal needs may not cause an explosion of legal services – but neither will it materially affect the legal practices of those who do not now serve those legal needs. Another example of simple innovation arises from the observation that our current regulatory system only permits practices owned by licensees and legal aid clinics to deliver legal services to the public. There are many organizations in society that are dedicated to serving vulnerable and other communities. It would be innovative, for example, to permit the CNIB to provide relevant paid legal services to the blind and partially sighted Canadians. The value of this approach is demonstrated by the pro bono legal services now delivered by Pro Bono Law Ontario’s Children’s Hospital Projects which provide relevant legal services to sick children and their families where and when needed. While we often think that innovation only means fundamental change like Watson/artificial intelligence, many important innovations are evolutionary within existing businesses rather than revolutionary. And of course, innovation is the product of many factors. Competition is one factor and especially competition, or potential competition, from other innovators. Expertise and money are also factors. The consequences of failure and the prospects for success are others. Regulation can constrain innovation by limiting innovative competition and by limiting the human and economic resources available for innovation. The Innovation in legal services report mentioned above provides evidence of the effect that regulation has on innovation. Steve Brooker, Director of Research for the Legal Services Board, summarized some of this in his presentation to the International Conference of Legal Regulators held in late July in Toronto. As Mr. Brooker noted, the research showed that ABSs are 13-15% more likely to introduce new legal services than other types of regulated solicitor firms and that legislative change and regulatory change are the two most commonly cited drivers of innovation. Mr. Brooker also observed that the research shows greater innovation in the unreserved areas with 43.5% of unregulated providers being owned by non-lawyers, 10% of revenue being generated from innovative products compared to 5% of revenue for solicitors firms and with 2.3% of revenue being spent on branding/marketing compared to 1.6% for solicitors and 0.5% for barristers’ chambers. We are challenged by the Chief Justice to embrace change. As a matter of professionalism, we should be vitally concerned that the public have access to legal services. Allowing others to provide legal services is part of the answer. Allowing and encouraging innovation from current legal practices to address currently unserved legal needs is another. Some lawyers resist change because the consequences of change may not be positive. Competition, especially innovative competition, carries the prospect of loss. But trying to ensure that change does not occur is ultimately a pointless exercise. Change will happen. New forms of supply and unserved demand create inexorable pressures. My view is that it is in the interest of the legal profession and in the public interest that innovation happen within the legal profession so that the legal profession does not wither in the face of change. And it is in the interest of the legal profession and in the public interest that others be permitted to do what can properly be done by others. While attending the CBA annual conference, I had the benefit of attending a presentation by Jonathan Smithers, the new President of the Law Society of England and Wales (the representative body, not the regulator). Jonathan’s background is conveyancing and land law. He heads the residential property team at Cooper Burnett in Kent and was previously Chair of the Conveyancing and Land Law Committee at the Law Society. His presentation centered on the ABS experience in England and Wales. While indicating that it was too early to judge the ultimate effect of ABS liberalization, Jonathan’s view was that ABS is not likely to be the source of transformative change to access to justice nor a source of harm to the public interest or the interests of the solicitors. Rather, Jonathan was confident in the ability of able solicitors to innovate and compete and accepting of the necessity that they must do so. Most significant to me was the message that the simple fact that new innovative entrants are permitted has caused existing solicitor practices to step up their game and innovate. His confidence in English solicitors and his obvious professional and business expertise were impressive. The Chief Justice is one of many voices calling for innovation. The voice of the Chief Justice is, of course, particularly authoritative but can only be persuasive. It is for our self-regulated profession to decide through our governing bodies what change is appropriate. But as the Chief Justice said, the question is not whether to change. The question is what change is appropriate. Is the World as We Know it Coming to an End? Each year, the Law Society of Upper Canada has an awards ceremony at which very worthy lawyers and paralegals are honoured. Hearing about the contributions and professional lives of the award recipients is inspiring and underscores the value of our professions to the society that we serve. There was a whimsical theme in some of the speeches this year. By way of good-natured self-deprecation, one recipient described receiving the call from the Treasurer telling him that he had been awarded the Law Society Medal. He said that his first reaction on learning that there was a call from the Law Society was to wonder what he had done wrong, certainly not that he was being awarded for having done good. Other recipients identified with this comment. As with most good humour, there was some hard truth underlying these amused words. Being in a self-regulating profession means that we collectively set standards of professional conduct and enforce those standards by discipline. Communications from the Law Society are nervous-making for that reason. Our relationship individually, and collectively, with the Law Society is ambivalent. The complicated relationships arising from professional self-regulation have been highlighted for me in several recent discussions, both in private and in Convocation. One discussion was about the upcoming move of the Law Society Tribunal out of Osgoode Hall to its own offices with some benchers objecting. Objections to the move could be seen as being old-fashioned and anachronistic – just as the Law Society is often seen to be by many. Another issue raised in Convocation was about increasing use of appointed non-bencher adjudicators. This could be seen as being concern about loss of authority and importance. In another discussion, a bencher colleague raised the same issue worrying that the nature of discipline adjudication could suffer by the use of those skilled as adjudicators rather than by those elected by, knowledgeable about, and supportive of, the profession. Some history may help better understanding of what underlies these concerns. For most of the long history of the Law Society, discipline proceedings were not by hearing panels applying the Rules of Professional Conduct. Rather, the benchers in convocation considered whether lawyers had misconducted themselves applying their collective view of what was proper professional conduct. The senior members of the profession, as they were, directly governed a much smaller profession. The earliest Professional Conduct Handbook that I have found was released in 1964. It was signed by Treasurer John Arnup, as he then was. In a preface, Mr. Arnup wrote that “This handbook contains rulings of the Professional Conduct Committee of Convocation upon some important aspects of professional ethics, as well as certain previously published notices from the Discipline Committee, the Canons of Ethics of the Canadian Bar Association and the Rules of the Law Society respecting accounts”. Mr. Arnup went on to say the “As further rulings and reasons for judgment of the Discipline Committee in matters of general interest are approved by Convocation, they will be printed in the Ontario Reports in a convenient form, so that they may be readily detached and added to this handbook”. Much like the common law, the rules of professional conduct by the 1960s were the rulings and reasons approved by Convocation. The present Canons have been supplemented, from time to time, by Rulings or Rules of various Governing Bodies which have been published and have received wide distribution. While these have been helpful to the profession, in many instances they deal with isolated subjects and are not co-ordinated. By the late 1990s, the Professional Conduct Handbook had become the Rules of Professional Conduct in Ontario. After harmonization through the Federation of Law Societies Model Code, the professional conduct rules across the country are now generally known as the Codes of Professional Conduct. What was once the case-specific judgments of the senior members of the bar is now a regulatory code of conduct. There has also been a significant change in the way that allegations of professional misconduct are adjudicated. As Mr. Arnup’s preface indicates, discipline decisions in Ontario were once made by bencher member of the Discipline Committee subject to the benchers as a whole in Convocation. To the 1990s, Convocation in Ontario sat in what was called Discipline Convocation to receive reports from the Discipline Committee. Convocation would receive the report and recommendation of the Discipline Committee, hear submissions for the Law Society and for the Lawyer and make its decision which might or might not be as recommended by the Discipline Committee. By the end of 1999, discipline decisions in Ontario were no longer by the Discipline Committee and Convocation but rather by hearing panels with a right of appeal to the appeal panel. There is a third significant change made over the decades. For most of the history of the Law Society, the benchers were elected lawyers[i]. Following the McRuer Inquiry into Civil Rights and informal innovation by the Law Society under the leadership of the great Sydney Robins, the Law Society Act was amended in 1973 so that four (now eight) non-lawyers appointed by government became benchers. The first lay benchers joined Convocation in 1975. [ii] More recently, elected paralegal benchers joined Convocation as a result of the 2006 amendments to the Law Society Act whereby the Law Society came to be the regulator of paralegals as well as lawyers. The composition of Convocation has changed although elected lawyer benchers still predominate. Amy Salyzyn reported and commented on a significant further change in her post to this column in late 2013 entitled Magic Bullet or Band Aid? LSUC’s “Enhanced Tribunals Model. Starting in September 2013, David A. Wright became the first full-time non-bencher Chair of what is now the Law Society Tribunal[iii]. While less noted, this appointment is paralleled by an increase in the proportion of non-bencher lawyer, paralegal and lay adjudicators appointed to the Law Society Tribunal and other changes[iv]. When one envisages the evolution from discipline by senior lawyers in Convocation reflecting their views and experience as to what was proper conduct to disciplinary adjudication by hearing panels of lawyers, paralegals and lay people, some of whom are benchers, applying regulatory codes of conduct, it is clear that much has changed. Moving the Law Society Tribunal out of Osgoode Hall symbolizes these significant changes. There was a time when Convocation Room was the place where professional discipline was decided by lawyer benchers based on their collective judgment. That time has passed. The role of the elected bencher in discipline is much different than it once was. There are, of course, sound reasons for this significant evolution. It is difficult to govern one’s affairs based on what the “great and the good” may consider proper after the fact. Decision-making about individual conduct in Convocation by dozens of people based on submissions and speeches has obvious frailties. Elected benchers, even with appointed lay benchers, sitting on hearing panels may not have the experience and skills to provide the best possible adjudication. Recent innovation has been designed to professionalize adjudication of the conduct of lawyers and paralegals in Ontario. But “so what?” – isn’t this progression all to the good? Aren’t benchers who are concerned about this obviously necessary evolution simply old-fashioned and self-important? The point of this column is to suggest, as is so often the case, that change is often complicated, with things being potentially lost as well as things being potentially gained. The potential gain in independent adjudication by experienced skilled adjudicators is evident. It seems clear that better adjudication was needed and that these changes were required. To use Amy Salyzyn’s slaw.ca column title, this is no magic bullet nor is it a mere Band Aid. The potential cost and the concern expressed by some may reflect the several rationales for self-regulation. One of the important rationales for self-regulation is the importance of independence from the state. If the government regulates the legal professions then defence of accused persons in government prosecutions is put at risk of potential impairment. More broadly, it seems clear that lawyers are important protectors of rights and freedoms and that independence from the state is arguably fundamental feature of a free and democratic society. This broad notion of independence of the bar was recently found by the Court of Appeal for British Columbia[v] to be a principle of fundamental justice, although that was not accepted by the Supreme Court of Canada[vi]. But it seems obvious that distancing adjudication of professional conduct from the Law Society is not inconsistent with this broad notion of independence. Whether by a tribunal with appointments by Convocation or by the Law Society itself, this discipline is independent of the state. Another rationale for professional self-regulation is effectiveness. Lawyers, doctors and engineers, for example, best understand proper professional practice in their respective domains. Realistically, it would be difficult to see effective professional regulation without the professional expertise of those being regulated. This effectiveness of course must be balanced against the risk of self-interested regulation. There is the risk that lawyers may not set standards as high as they should because colleagues are being judged or because lawyers can imagine themselves in the same situation. For these reasons, for transparency, and for better perspective, the requirement of a lay person on each hearing panel is important. Some say that appointing tribunal members with adjudication expertise could compromise this effectiveness. Finding adjudicators who have experience and expertise in both legal practice and in adjudication might be a challenge. Whether one speaks of pendulums swinging or the law of unintended consequences, solving one problem can sometimes lead to another. Adding adjudicative expertise might lead to diminution in practice expertise. Adding adjudicators who are not involved in self-regulation, including setting conduct rules, risks loss of regulatory expertise in adjudicative decision-making. But this need not be a question of absolutes but rather should be a matter of balance. Both expertises are needed. While perhaps not be available in each individual adjudicator, the Tribunal as a whole can have the necessary expertise and adjudicator education may assist. In any event, this concern may be an example of our common tendency to reflect back on the good old days that never were and our tendency not to recognize that things have changed. I wonder whether the most senior members of the bar “back in the day” really understood the practices of ordinary lawyers. Perhaps. Also, modern practice is varied and specialized. Is the better answer specialized panels, panels of small firm real estate solicitors, big firm litigators, paralegals and in-house counsel for example, each dedicated to cases from within their sphere? That answer has its own challenges. Some of the concern about these innovations appears to be about something else. What is said by some is that the establishment of an independent Tribunal is inconsistent with self-regulation. Their assertion is that being elected is important, in and of itself, to discipline adjudication. There seem to be two aspects to this assertion. The first is that elected adjudicators will be better adjudicators by virtue of having been elected. The notion is that those selected by the profession as a whole will be best qualified. The second is that those subject to discipline and those evaluating discipline decisions will better accept the judgments of those elected by the profession. What seems to be at issue is expertise and legitimacy within the profession. If a correct reading of what underlies this concern, I find this interesting as perhaps reflecting something of a democratic rationale for self-regulation – that those we elect have greater legitimacy and expertise in telling us what to do (and not do). But, I personally do not find this to be particularly compelling. Canadians, rightly I think, are not much impressed with the legitimacy or expertise of elected judges. While there is functional overlap between rule/policy setting and adjudication, the benchers remain responsible for the conduct rules and appointment of the adjudicators. We elected benchers are, I suspect, more impressed with our own importance having been elected than are our colleague electors. And as to the legitimacy of the traditional elected-bencher system, it is not obvious that there is much existing reverence for the results of that approach. At the risk of ending on a rather unexciting note, my take on all of this is that we find ourselves in a pretty sensible, albeit inevitably imperfect, place. Change always risks loss. Predicted gains are not always achieved There is value in professional pride in tradition and tradition can be founded on good policy values that are not always evident. But it also seems clear that better adjudication has been needed and that the work done over the last decade by Mark Sandler and others has led to better adjudication. We will never get this right. In making changes, we will undershoot and overshoot. We will cause new problems by solving old problems. But taking into account the relevant principles, I think that we are getting it righter. [i] Long-term elected benchers became life benchers until recently. [iii] Notably, David was formerly the chair of the Human Rights Tribunal of Ontario and is highly regarded for his expertise and leadership. Canadian Lawyer recently included David as a nominee for the 2015 Most Influential lawyers in Canada for his leadership of the Human Rights Tribunal of Ontario and the Law Society Tribunal. Independence and Self-Regulation: I’m OK but I’m Not So Sure About You! It is entirely human to fail to appreciate when one’s judgment is affected by a conflicting personal interest or duty. Our conflicts rules reflect this problem. Where there is a substantial risk of impairment of representation, clients get to decide whether to accept that risk. Where representation will be materially impaired, lawyers cannot act even with client consent. This concern about conflicting interests is well rooted in behavioural psychology. Dan Ariely, an author and a professor of psychology and behavioural economics[i], writes on this topic[ii]. In his book The Honest Truth about Dishonesty, Professor Ariely describes an experiment in which participants were asked to view and rate sixty paintings. Each participant was paid an honorarium. The wrinkle in the experiment was each participant was told that their honorarium was sponsored by one of two art galleries. Each painting was presented as if it came from one or the other sponsoring gallery. After rating the sixty paintings, each participant was asked whether the sponsor’s logo affected their ratings. The participants universally thought not. Yet they were wrong. There was a substantial effect. And the effect increased with the amount of the honorarium. It is startling that independent judgment could be so easily skewed and that the participant wold not perceive the skewing. Professor Ariely says that “While we may realize that such conflicts exist and that they influence others, we fail dramatically in perceiving both the extent of their effects and our own susceptibility to them”[iii]. He describes a lecture that he gave to about two thousand members of the American Medical Association during which he asked the physicians whether they felt that their medical judgments were affected by conflicts of interests with their hospital, drug manufacturers, insurance companies, medical device manufacturers or pharmaceutical sales representatives. Not a single physician raised their hand. But nearly ever hand was raised when he asked whether the audience believed that the majority of other physicians in the room were influenced! In a democratic society that honours the rule of law, independence of legal counsel from the state is particularly important. This is particularly true in criminal and charter cases. But independence matters in many other areas given the omnipresence of government regulation and the power, political and economic, of the state in modern society. Canadian law society regulation takes this thought of independence to another level. Canadian law societies, unlike the regulators in Australia and England, are independent of the state. Unlike in the United States, Canadian law societies are also independent of the judiciary. In this way, independence of individual lawyers is protected both by limiting potential control of individual counsel by the state or the judiciary and by the independent establishment of codes of conduct and other rules. This independence is achieved by the election of law society benchers by lawyers and, in Ontario, regulated paralegals. There are advantages to self-regulation other than independence. Legal practitioners are well positioned to identify issues that need to be addressed in regulation, to establish appropriate codes of conduct and to sensibly judge professional conduct. It seems reasonable to think that a self-regulated profession is better attuned to its professional responsibilities. There is of course a risk that self-regulation can be self-interested regulation rather than regulation in the public interest. It is not so long ago that there was debate about the primacy of the public interest although that issue is well-settled now. But mostly, there is little if any practical dissonance between the public interest and the interest of the profession. For example, the profession easily accepts that its members should be competent to practice and practice ethically. But there are issues where the public interest and the interest of members of the profession are not entirely aligned, sometimes even opposed. There are also issues where interests of different parts of the profession differ from each other and from the public interest. In previous columns, I have referred to scholarly writing about some historic examples. There is now a limited safeguard currently in place against self-interested self-regulation. In Canadian law societies, typically twenty percent or so of benchers are non-lawyers. These non-lawyer benchers are chosen by government in some provinces and by other means in other provinces. This is valuable both to assist the law societies in avoiding professional self-interest and by adding to the perspectives and expertise at the table when decisions are being made. But the substantial majority of benchers are elected by the profession and are themselves regulated by the law society. Of course, there are advantages to elections for benchers. Because benchers are elected, their decisions will likely have greater credibility with their electorate. Elected benchers are more likely to understand the issues facing the profession. But there are problems as well. As in the painting rating experiment described by Professor Ariely, elected regulators will have a sense of loyalty to their electors; partly in gratitude for election, partly because of an interest in re-election and partly because a natural sense of a representative obligation to one’s electors. All of this compounds the potential bias that exists from regulating one’s self. There is another difficulty with election in that the diversity of the profession is not necessarily reflected in election results nor are the required skills necessarily found in those elected. One common refrain in Ontario comes from solicitors who are concerned that their perspectives (and, tellingly, their interests) are not sufficiently reflected in election results. The just-released report of the Canadian Bar Association Futures Initiative addresses this issue amongst a number of other important issues relating to legal education, innovation and ethics/regulation[iv]. The governing bodies of law societies should be made up of elected lawyers, as well as a significant number of appointed lawyers and non-lawyers. The appointed governors should be selected by an independent appointment process designed to fill gaps in experience, skills and diversity. Electing 80% of law society directors is problematic because it does not necessarily provide appropriate diversity of expertise, perspective, and lived experience; it can cause overrepresentation of some parts of the profession, and under-representation of others. Election of law society directors tends to result in a board that is older than the profession generally and less demographically diverse. Bringing different perspectives to governance serves the public interest because it grows capacity from under-represented groups within the leadership of law societies. It is also crucial to strengthening diversity and inclusivity in the profession, since the increased presence of diverse groups in the profession cannot alone affect the governing norms, privileges, and access to opportunities within the profession. Similarly, the election of 80% of law society directors lends some truth to the perception that self-regulation may tend to protect the interests of the profession. Running for election risks creating the false belief among some law society directors that their role is to represent their electors, which may result in election platforms designed to be attractive to that group. Not surprisingly, elected benchers tend to be supportive of the current approach to selecting benchers. This is presumably in part because there is value to election. But it is probably true that elected benchers, being human, tend to think that a process that selected them must be a good process and that they themselves act entirely in the public interest despite being members of the profession and being elected. To be facetious, just like the physicians in Professor Ariely’s audience, I have no concern about myself as an elected lawyer bencher but I do wonder about others! Less facetiously, it seems clear that being elected, and the proximity of the next election, affects decision-making at the bencher table particularly where professional self-interest is at stake. It also seems clear that greater diversity of perspective, experience and expertise would be valuable to bencher decision-making. [i] Professor Ariely’s laboratory at Duke University is the wonderfully named Center for Advanced Hindsight. [iii] In his foreward as editor of The Best American Science and Nature Writing for 2012. [iv] By way of full disclosure, I partcipated in the Futures Initiative as Lead of the Ethics/Regulatory Team together with a great team comprised of Kris Dangerfield of the Law Society of Manitoba, Lisa C. Fong of Ng Ariss Fong in Vancouver, Tony Kavanagh of Bueti Wasyliw Wiebe in Winnipeg, Harvey L. Morrison, of McInnes Cooper in Halifax, Professor Marie-Claude Rigaud of the Université de Montréal and Professor Alice C. Woolley of the University of Calgary.